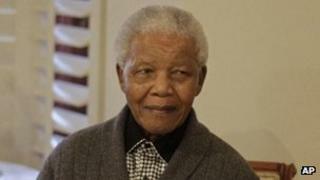 South Africa's ex-President Nelson Mandela remains in a serious but stable condition in a Pretoria hospital, according to the latest update. The presidency said Mr Mandela's condition was unchanged and confirmed that he was in intensive care. His former wife, Winnie Madikizela-Mandela, visited him on Monday. The government said in a statement: "President Jacob Zuma reiterates his call for South Africa to pray for Madiba and the family during this time." Madiba is Mr Mandela's clan name. In releasing the latest update, presidency spokesman Mac Maharaj also denied that visitors were being blocked from seeing Mr Mandela. He said: "The reality is that the normal procedures when a patient is under intensive care are applying from the medical side. "Therefore there are limitations on visitors and, you know, that when a person is in intensive care the doctors only allow some very close people to be there - it is not the way it is being presented in the media." The presidency said Mr Mandela had been ill for some days at his Johannesburg home, with a recurrence of his long-standing lung problems. He was admitted to hospital after his condition worsened at 01:30 on Saturday (23:30 GMT Friday). The BBC's Karen Allen in Pretoria says there is a quiet hope that the man who led the fight against apartheid may regain his strength once again. She says that many took heart from a visit on Sunday by Mr Mandela's daughter, Zindzi, who said that her father was "well" and "a fighter". Mr Mandela's wife, Graca Machel, cancelled a scheduled appearance in London on Saturday to remain at her husband's bedside. His eldest daughter, Zenani Mandela-Dlamini, was returning to South Africa from Argentina, where she is the ambassador, to visit her father, family sources said. Prayers have been said in churches across the country for Mr Mandela. Nelson Mandela served as president from 1994 to 1999. He was previously imprisoned for 27 years, and is believed to have suffered damaged lungs while working in a prison quarry. He contracted tuberculosis in the 1980s while being held in jail on the windswept Robben Island. He retired from public life in 2004 and has been rarely seen in public since. Nelson Mandela: Is it time for South Africa to let him go?